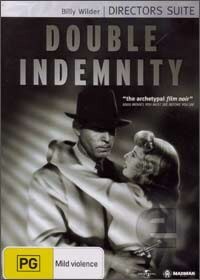 Double Indemnity is a Hollywood classic that features Fred MacMurray as Walter Neff, a suave and trusting insurance salesman who falls for one of his clients with her seductress ways who is played by the beautiful and talented Barbara Swanwyck. Under the charms of Phyllis Dietrichson (Swanwyck), they soon develop an adulterous relationship and both our stars create an elaborate plot to eliminate her husband in order to collect his life policy. The drama and tension that emanates from the onscreen performances of MacMurray and Swanwyck is sheer bliss and you really become drawn into their soon to be criminal world. Billy Wilder does an amazing job at directing the entire movie in this classic thriller that features some of the best acting of the previous century, truly making these actors two of the greats. With the film being nominated for seven Academy Awards, it’s easy to see why Double Indemnity has been dubbed the great noir film ever made. The picture quality of Double Indemnity is phenomenal for a film of this age and match that with superior audio quality and this movie is definitely quality from start to finish, thanks to the all new restored master. Even when it comes to extras, this DVD collection is definitely a must have for those that wish to know the behind the scenes and stars of this Hollywood noir classic.